This report displays a breakdown of revenue sources (credit card, cash, check, or insurance) for individual payments on all invoiced services. Click Reports > Billing > Payment Methods. This report can be filtered by date range, client name, and Payment Method. To filter the report, select the date range using the drop downs under Date Range. Type a client's name in the Client field and select the name from the drop down list that appears. If no name is selected, the report will include all clients. 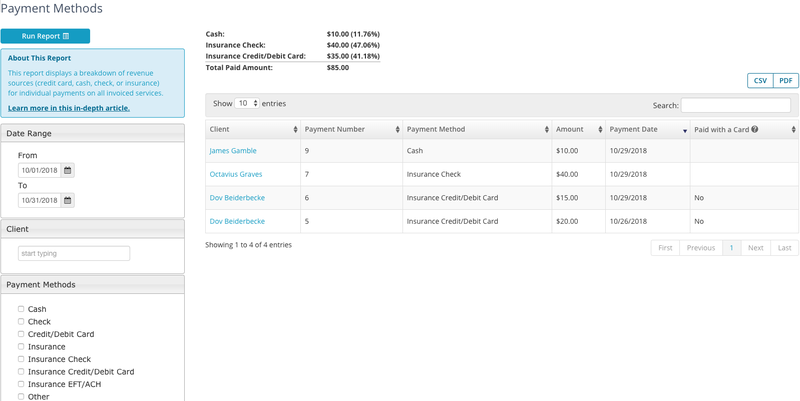 Specify a payment method by checking the Payment Method box(es) and click Run Report.